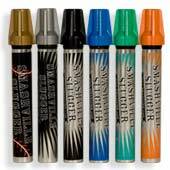 Great cutty marker like the grog paint cutters ,except make sue you shake and wait to see the ink start to flow and ink mix and look the correct way an not thin. Don't think your pens dead .. just shake profusely!! And good to go!. Lladts nice and long with great colors but temember -don't get the smash ko defently go with slugger(sluggers improved version AP correct me if I'm wrong). Inks way better just always remember to shake your money maker or it feel like a waste a money of only the thin ink seeps out. A great marker just make sure use correctly I bet that's we're the one bad review cane from user error. rOpe417(apreply) Actually the KO is the Upgrade. Its an ink/dye hybrid. Those who know what a proper tagger marker should be like, love it.